Sovereigns leave when patch 7.11 drops???? we dont get containers the last 1/3 of the arc? Ok, the way Sovereigns are being handled in the UK Arc is weird. The Arc is to run 3 patches, 7.9, 7.10 and 7.11 which is from Sep 20th to Dec 10th. So WHY are Sovereigns being converted to credits when Patch 7.11 drops Nov 14th? That makes no sense. Will we not earn RN containers after Nov 14th? Will the UK Arsenal leave on Nov 14th as well? Since we won't have sovereigns to spend in the Arsenal any more, it seems likely. What about Coassack in the Arsenal? We won't get the 48th Guinea until Dec 8th at the earliest? Will the UK Arsenal stay with only Cossack in it? @Pigeon_of_War, @Gneisenau013, @turbo07, @WolfofWarship what about the last 1/3 of the UK event please? If sovereigns are removed on Nov 14th, we won't get RN containers from Nov 14th until the event ends on Dec 10th? We get the last Guinea on Dec 8th at the earliest, so WHY remove sovereigns on Nov 14th? Did the higher ups that made these decisions give any reasons for ignoring the last 1/3 of the UK event please? Patch 7.11 Nov 14th Sovereigns converted to credits with 1/3 of the event left to go? So no RN containers in patch 7.11? What reward will replace them please? What reward will replace them please? Consider that Vanguard and Dreadnought have been announced, and should be ready by then. But yes, I also want answers to these questions. I suspect we mere mortals will be able to get ONE out of Warspite and Gallant, and those who make the top of the Hall of Fame leaderboard might be able to scrounge up enough for two. I haven't crunched numbers; that's just my wild guess. This being said, I already have Warspite and Gallant, and will be trying my hardest to get as many Guineas as possible. Technically you can only earn 48, but you want to bet they toss out the occasional CC-like container with the possibility for the extra two? Maybe they’ll hold a stream and feed us some? We can wish right! I expect we will get 400 Sovereigns at most as a SWAG. From my calcs on the expected cost of Guineas (based on other T8 DDs), I figure that buying two will be $1-2 in the shop. Ours is not to reason why, ours is but to do and die. All will be clear by tomorrow evening. I think I'm going to leave my computer running in the morning, as I'm sure this update will take quite a while! Personally, I am gunning for the Warspite, Cossack is an afterthought. What I am afraid is that since in the rules they stated some missions can only be done with RN DDs, these will be the ones rewarding the Guineas for the Cossack. This way people can be attracted to buy premium containers for the unlock missions. I am positive that you will be able to earn the 48 guines during the 3 patch British Arc. Yeah, but he was really kind of an A-hole, still owes me $5. people can be attracted to buy premium containers for the unlock missions. c) Based on what happened in the French event, I suspect there are a LOT of people who are going to end up with at least an Acasta in their port at a very early stage. Even in the North Cape event, Duke of York was only ever a fast track to finish the missions and unlock the New Year phase. So long as you had battleships, cruisers and destroyers, completing North Cape was hard work but not impossible. (I didn't have the T5+ battleships that would have made it much easier for me. I learned from that and diversified, to my ultimate benefit.) SOME of the guinea missions might be DD-dependent, but I don't think they can all be. Not all. WG said that the Stages would end on Tuesday. Some are thinking that we will have most of the day on Tuesdays to finish. I think it might be at 4am when the Stages start meaning that Tue will mostly be blocked from working on Directives. We will find out on Sep 25th. @QinsCoCoPops want to volunteer to leave a Directive undone and try it on Tue to see if it works? Nope, 1 Guinea per Directive completed. Some of the Missions to complete a Directive will require a T5+ UK DD. For Patch 7.9 that is Gallant and any early access UK DDs that are completed. After Patch 7.10, it will be any T5+ UK DD as the UK DDs are released on 7.10 on Oct 17th. WG said that the Stages would end on Tuesday. Some are thinking that we will have most of the day on Tuesdays to finish. I think it might be at 4am when the Stages start meaning that Tue will mostly be blocked from working on Directives. Concerning this, yes, there is mystery - but the game interface as we play it is always more informative IMO than the patch notes. And we will know at first hand how much guineas cost. THAT will be clear by Wednesday evening. Oh yeah. Based on the cost of other T8 DDs, I expect 2 Guineas will be roughly $1-2. We will know when the Shop gets updated with Guineas. I understand that Cossack may not come out until patch 7.10, but if it comes out 7.9 and Guineas are in the shop, then some people will just buy Guineas to get Cossack now, instead of waiting until Dec 8th for that 48th Guinea. What I am still not clear on is exactly what will cause standard RN containers to drop. RN containers will be Mission rewards. That is how it worked in the PTS. Some Directives in the PTS gave a premium RN container for completing it. Don't know if premium RN containers will be rewards. The RN Rules article made it seem like that would be yes, but the 7.9 patch notes didn't say anything about premium RN containers being a reward in game. RN containers will be Mission rewards. That is how it worked in the PTS. Thanks. I missed the PTS due to being away on holiday or wanting the last of my time before going away to accomplish other things (get as many anniversary tokens as I could before going). So it's all unfamiliar ground to me. This is what the Stage screen looks like. 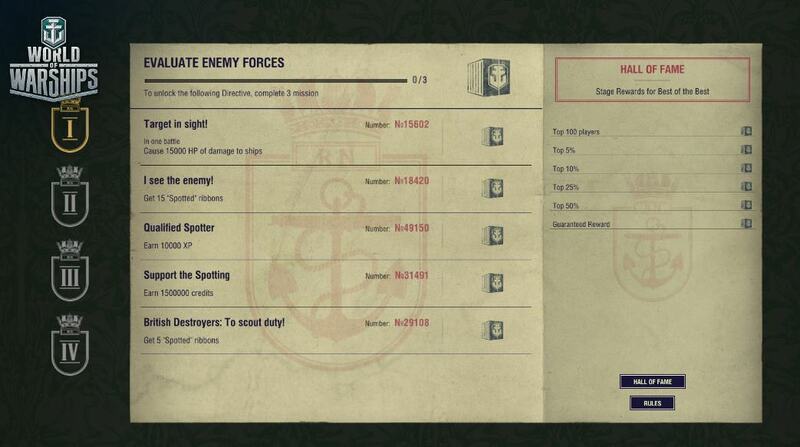 The missions in the middle are where you should earn the RN containers. Not every mission reward will be an RN container. The four shields on the left and they are the four Directives for each Stage. So this screen shows the 5 Missions for Directive I and you only have to complete three Missions to complete Directive I. All the missions, except for the UK DD only Missions, are active at once, so you may complete multiple Missions in the same battle. As you can see, the 5th Mission for Directive I is for British DDs, so you will either need Gallant or an early access UK DD in patch 7.9. In patch 7.10, the UK DDs are released. The Mission progress bar will go across the missions and you can see that you only need 3 of 4 Missions to complete Directive I, if you don't have a UK DD to use. If you play a T5+ UK DD, then all five of the above missions would be active. Play T5+ something else and the top four missions are active as the bottom one requires a T5+ UK DD. Based on what I've seen of the event and of the RN DDs, I'm likely not putting much extra effort into this event anyway. Especially with the carrier "rework" and the whole "subs" thing, and the way WG treats customers, not sure I care that much any more. The CV rework is still testing and if the testing doesn't go well, it won't be done. Subs are just a proof of concept and will people like it, it is not a done deal either. Relax. No different then buying doubloons to fxp past ships , maybe even cheaper . The early access missions give you the ship fully researched and with all modules purchased, so that can be a lot of XP and credits saved. Figure 14-15k XP and 1.5-1.6M credits for the T5 Acasta as a rough estimate. For the T8 Lightning figure 160k+ XP and 10M+ credits saved. While an early would be a bonus, I think I will quite happily play my way through the lower tier ships also. I've been waiting for this with great eagerness.